Neymar, as we all know, likes to get the referee's attention most times when he is on the pitch. The Brazillian star player was seen rolling and screaming after Mexico's Layun subtly stepped on him while trying to pick the ball up during their World cup 2018 quarterfinal match. 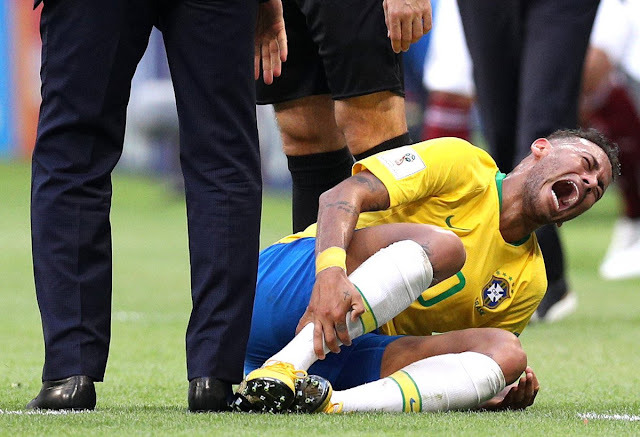 With Brazil leading 1-0 the match when the incident happened, it was obvious Neymar was trying to get the Mexican player sent off by acting like he was hit by a hammer. "Neymar is like the boy who cried wolf. He claims a monster is coming so often that when the wolf does arrive, no one believes him"
Sad day for Mexico. Well done Brazil, but have a word with Neymar. I'm pretty sure after this world cup he'll be changing his name to Oscar. "I wouldn't like to see him coming out of the doctor's surgery after a flu injection. He is pathetic. Absolutely pathetic!"